The light curve data for MOA-2016-BLG-227 is plotted with the best-fit model. The top panel shows the whole event, the bottom left and bottom right panels highlight the caustic crossing feature and the second bump due to the cusp approach, respectively. The residuals from the model are shown in the bottom insets of the bottom panels. Credit: Koshimoto et al., 2017. (Phys.org)—Astronomers have found a new massive alien world using the gravitational microlensing technique. The newly detected exoplanet, designated MOA-2016-BLG-227Lb, is about three times more massive than Jupiter and orbits a distant star approximately 21,000 light years away. The finding was published Apr. 6 in a paper on arXiv.org. Gravitational microlensing is an invaluable method of detecting new extrasolar planets circling their parent stars relatively closely. This technique is sensitive to low-mass planets orbiting beyond the so-called "snow line" around relatively faint host stars like M dwarfs or brown dwarfs. Such planets are of special interest for astronomers, as just beyond this line, the most active planet formation occurs. Hence, understanding the distribution of exoplanets in this region could offer important clues to how planets form. The microlensing event MOA-2016-BLG-227 was detected on May 5, 2016 by the Microlensing Observations in Astrophysics (MOA) group using the 1.8 m MOA-II telescope at the University of Canterbury Mt. John Observatory in New Zealand. Afterward, this event was the target of follow-up observations employing three telescopes located on Mauna Kea, Hawaii: the United Kingdom Infra-Red Telescope (UKIRT) 3.8m telescope, the Canada France Hawaii Telescope (CFHT) and the Keck II telescope. VLT Survey Telescope (VST) at ESO's Paranal Observatory in Chile and the Jay Baum Rich 0.71m Telescope (C28) at the Wise Observatory in Israel were also used for these observations. This subsequent observational campaign allowed the research team led by Naoki Koshimoto of the Osaka University in Japan to detect the new planet and to determine its basic parameters. "The event and planetary signal were discovered by the MOA collaboration, but much of the planetary signal is covered by the Wise, UKIRT, CFHT and VST telescopes, which were observing the event as part of the K2 C9 program (Campaign 9 of the Kepler telescope's prolonged mission)," the paper reads. The team found that MOA-2016-BLG-227Lb is a super-Jupiter planet with the mass of about 2.8 Jupiter masses. The parent star is most probably an M or K dwarf located in the galactic bulge. The mass of the star is estimated to be around 0.29 solar masses. MOA-2016-BLG-227Lb orbits its host at a distance of approximately 1.67 AU. Other main parameters like the radius of both objects and orbital period of the planet are yet to be determined. "Our analysis excludes the possibility that the host star is a G-dwarf, leading us to a robust conclusion that the planet MOA-2016-BLG-227Lb is a super-Jupiter mass planet orbiting an M or K-dwarf star likely located in the Galactic bulge," the researchers concluded. 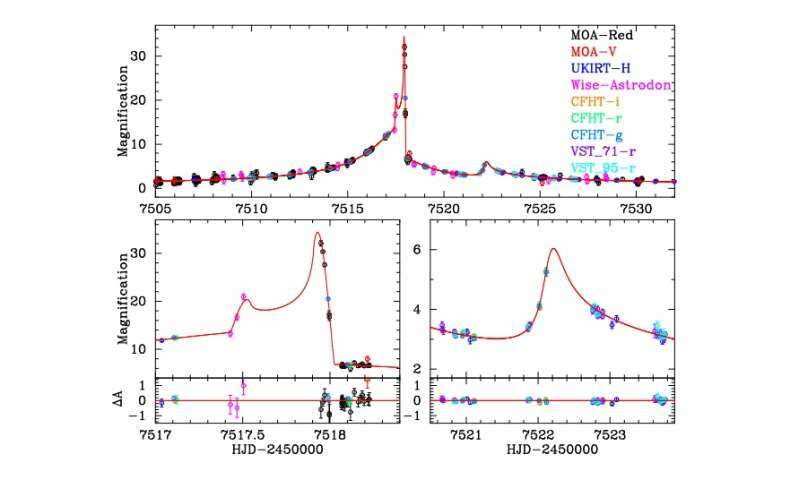 The authors call for further investigation of the MOA-2016-BLG-227 event, which could deliver essential more detailed information about the newly found planetary system. They noted that this event should be revisited with the Hubble Space Telescope (HST) and Keck adaptive optics (AO) system. Promising results could also come from future space and ground based telescopes like the James Webb Space Telescope (JWST), the Giant Magellan Telescope (GMT), the Thirty Meter Telescope and the Extremely Large Telescope (ELT). We report the discovery of a microlensing planet —- MOA-2016-BLG-227Lb —- with a massive planet/host mass ratio of q≃9×10−3. This event was fortunately observed by several telescopes as the event location was very close to the area of the sky surveyed by Campaign 9 of the K2 Mission. Consequently, the planetary deviation is well covered and allows a full characterization of the lensing system. High angular resolution images by the Keck telescope show excess flux other than the source flux at the target position, and this excess flux could originate from the lens star. We combined the excess flux and the observed angular Einstein radius in a Bayesian analysis which considers various possible origins of the measured excess flux as priors, in addition to a standard Galactic model. Our analysis indicates that it is unlikely that a large fraction of the excess flux comes from the lens. We compare the results of the Bayesian analysis using different priors for the probability of hosting planets with respect to host mass and find the planet is likely a gas-giant around an M/K dwarf likely located in the Galactic bulge. This is the first application of a Bayesian analysis considering several different contamination scenarios for a newly discovered event. Our approach for considering different contamination scenarios is crucial for all microlensing events which have evidence for excess flux irrespective of the quality of observation conditions, such as seeing, for example.